Dr. Paul Mandigers graduerer MR scanninger og udsteder attester på hollandske hunde. Dr. Paul Mandiger er specialist i neurologi og har arbejdet med MR scanninger siden 1996. Han er også anvendt til at graduere på bl.a. svenske og sydafrikanske MR scanninger. Dr. Paul Mandigers (graduated in 1992, specialization 1996, promotion 2005) is a veterinary specialist in neurology and internal medicine. He is a diplomate of the European College of Veterinary Neurology and as such a European specialist of the EBVS. From his specialization, he had several functions (among others a research appointment, clinician and supervisor) at the Departement of Clinical Sciences of Companion Animals (Utrecht University) and has worked, on a part time base, for nearly 18 years in a referral clinic. As of 2012 he is head of the section of neurology within the neurology-neurosurgery center, and carries the title of Clinical Associate-Professor. Currently he oversees three PhD projects with a strong focus on hereditary neurologic disorders (www.uu.nl/ecgg). Already many disorders have been addressed of which, among others Hereditary Necrotizing Myelopathy in het Kooikerhondje, Chiari Malformation and Syringomyelia in the CKCS and Paroxysmal dyskinesia in "Het Markiesje". He is ECVN resident trainer and member of the International Veterinary Epilepsy Taskforce (www.IVETF.org), the international Veterinary Diskynesia Taskforce and stuurgroep 'FairFok". 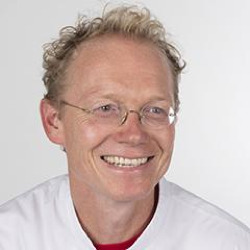 He has a growing number of peer-reviewed publications and has given over 300 oral presentations at (inter)national conferences and meetings (www.paulmandigers.nl). He sees himself as a passionate clinician, researcher and educator. In normal life he is married and father of two sons, likes long distance walking and survival runs.